Professional quality haircuts at home! This 22 piece kit features Lube-for-Life stainless steel blades, an ergonomic design for better control and a powerful motor with 7,200 cuts per minute. 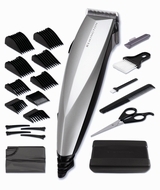 It also includes: hair clipper, trim-length guide combs, blade guard, salon-styled scissors, barber's comb, sectioning clips, styling comb, left & right ear guides, neck brush, cleaning brush, and hard storage case. It has Reduced vibration and provides professional quality results.